If you've been hankering to do some steampunk jewelry making (or just want to know what the heck this steampunk business is all about) then you're in the right place. What Does Steampunk Inspired Jewelry Look Like? I've been working like a busy little beaver on these Steampunk Jewelry Making pages so I hope you enjoy them! Category Overview: What will you find here? What will you find if you peruse around these steampunk jewelry making pages? First we'll discuss what is steampunk. If you have been hearing the term "steampunk" being bandied about here there and everywhere, but don't have a clue what it might be, then look no further. You'll get a brief definition and description of steampunk history to catch you up (and make you sound arful smaht at cocktail parties with intellectual types). Themes vary by steampunk afficionado, and everyone seems to have their favorite. The steampunk themes discussion will let you in on the basics. Steampunk style.... Aah... Now there's something worth thinking about. What makes something "steampunk"? And of course, since this is a website about making jewelry, we need to focus in on the whole jewelry aspect of steampunk. The steampunk examples and inspiration gallery will be a feast for the eyes. If you yourself are a steampunk jewelry artist, then by all means, add to the collection of steampunk jewelry submitted by readers and newsletter subscribers like yourself. Take a look at the materials and colors that are oh so steampunk (once the page is up) before you go shopping for materials. Steampunk projects are probably what you are mostly here for if you are a creative type... 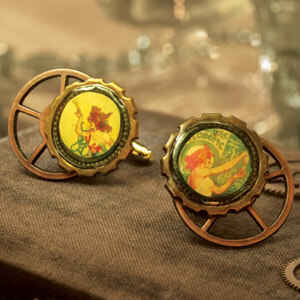 There is a steampunk ring and some steampunk cufflinks you'd be a fool not to want to make. For you obsessive types (like myself), I'm compiling a list of really cool steampunk jewelry books to add to your growing collection of jewelry making books. I only put the books that I myself have added to my library, and I'm curious if you have ones that you recommend too. Finally, a resource page... This is where you can find further resources should you want to continue steampunking around the 'net. If you have a cool resource to share, let me know by adding a comment to the resource page.